Last year, I wrote about the instore launch of the ready-to-wear line by Raishma and you'll be pleased to know that recently, Raishma launched an online store where shoppers from all over the UK and across the world can purchase these outfits! Raishma's collections are all about a fusion between East and West, and this is reflected in the versatility of the outfits. Each outfit has been designed so it can also be worn on it's own and the pricing options reflect this too - you get shown a price for the full outfit and for the dress only. The store already has a number of celebrity fans, including Coronation Street actress Shobna Gulati, presenter Tasmin Lucia Khan, and Holby City actress Rebecca Grant. Rebecca Grant shows how you can wear the dresses on their own. This paisley border design is £169 for the full outfit and is also available in blue. This sequinned churidar outfit comes will full length beaded sleeves and is £189. 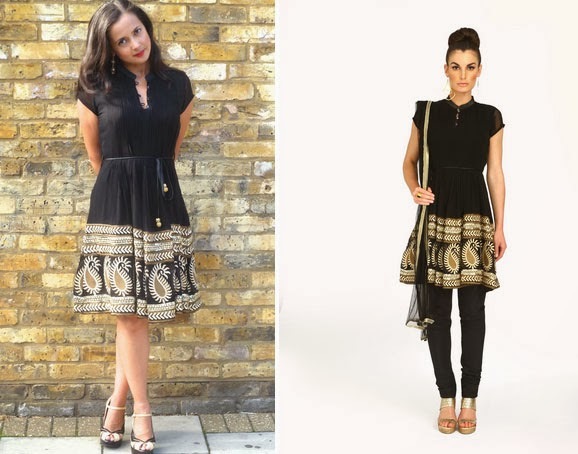 A favourite for under £100, look out for this tunic outfit on the red carpet at the 2013 Pride of Britain Awards as Shobna Gulati is said to have chosen this to wear! There's a sale on in the store right now, and you can pick up dresses from as little as £21 and full outfits from £35. 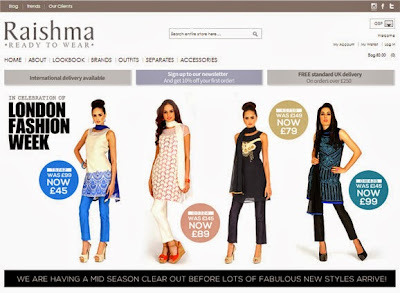 Visit www.fuzah.com to start shopping, and follow the Raishma Ready To Wear Facebook page for product updates.